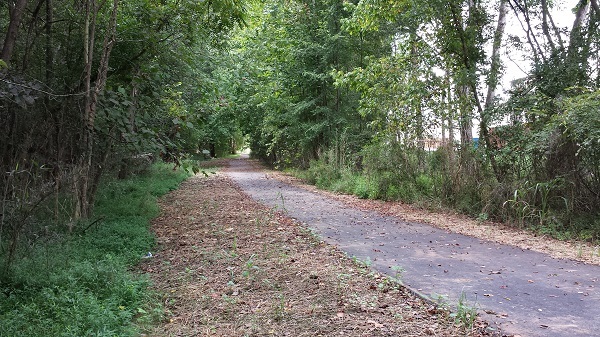 (September 6, 2014) Steele Creek has a new greenway trail located behind the new Shops at RiverGate South. It's only about 1000 feet long but offers a restful diversion from the hustle and bustle of the shopping center nearby. It runs east from Steele Creek Road along Hoover Creek to behind the gap between the new Home Goods and Gander Mountain stores. 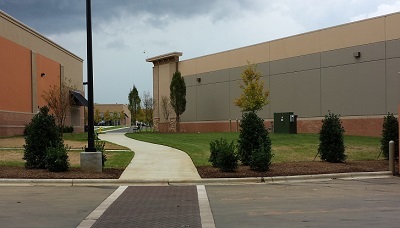 A walkway through a plaza connects the shopping center parking lot to the trail entrance. Two sets of stairs lead down from the service drive behind the stores to the trail. The developers of RiverGate paid for and built the trail to county specifications, except that the trail is eight feet wide rather than the county standard of ten feet. They are in the process of transferring ownership to the county so that the greenway will be part of the Park and Recreation Department's trail system. Due to its length and lack of connectivity (at the present time) it may not be included on the Park and Recreation Department's web site. The county's Master Greeway Plan calls for extending this trail eastward to connect to the Walker Branch Trail and westward to connect to at least S Tryon Street at some point in the future. County voters approved bonds in 2008 that included funding to extend the Walker Branch Greenway Trail with asphalt and bridges to Smith Road. That project is still a few years in the future. 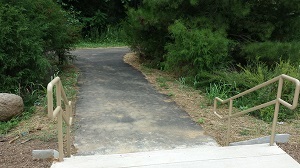 For more information on Mecklenburg County greenways, visit Mecklenburg County Park and Recreation Greenways.